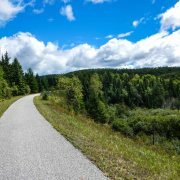 This bike trail travels through the Laurentian Mountains of Quebec from Mont Laurier in the north to St. Jerome in the south. It is French. It is spectacularly scenic. It is a biking foodie’s dream. This linear park provides a rail trail completed in 1996 on the bed of a train track built between 1891 and 1909. The path is 50% paved and 50% stone dust, smooth enough even for a road bike. The trail winds beside Riviere Rouge in the north and Riviere du Nord in the southern part of the trail. And this is lake country. We ride past Lac Nominingue, Lac Tremblant, and Lac Carre as well as smaller lakes. This is stunning north country with forests and waterways filling the landscape. We also encounter several villages along the trail. Nominigue, Riviere-Rouge, La Belle, Mont Tremblant, Ste Faustin, Ste Agathe. Val David, Val Morin, and Ste Adele all lie either directly beside or just off the trail. Many of these locations have restored the train stations originally built for the old railway. These now serve as trailhead facilities. On the trail our accommodations are at auberges along the way. These small inns provide not only unique surroundings but also memorable evening meals. When you add that to our picnic lunches beside the trail, at a covered bridge, and at the station in Ste Faustin, you can see why this trip is a foodie favorite. We meet riders in Saint Jerome and van to our hotel in Mont Laurier. We get bikes ready and gather for our first meeting. We van to a local restaurant for dinner. 34 miles– We bike from Mont Laurier to Lac Nominingue with a picnic lunch beside the trail. Our night’s stay is on a beautiful lake and includes an outdoor pool. 32 miles –We leave Nominingue and bike to La Conception. We have a picnic lunch just off the trail. Our night’s lodging is a special inn nestled in the woods. 34 miles–We bike from La Conception through Mont Tremblant to St Faustin for a picnic lunch at one of the many stations along the trail. The afternoon brings us past waterfalls into the village of Val David. 26 miles –On our last day we bike from Val David to St. Jerome, the official end of the trail for us. Some riders stop for lunch in the town of Prevost but most choose to wait and enjoy lunch at one of St. Jerome’s cafes. This tour’s trail has a crushed stone surface. It is quite smooth and suitable for all bicycles, but a larger tire will provide more stability. If you are driving: For this tour we meet riders in St. Jerome at the public parking lot near the train station. There are self service kiosks at the lot where you can purchase parking tickets and leave your car here during our tour. If you are flying, use Montreal Pierre Trudeau International Airport. Use ground transportation to meet us at our St. Jerome train station meeting location. More details will follow prior to the tour. At the end of the tour we will arrive by bicycle back at the St. Jerome public parking lot. Your lodging from Sunday, September 1st through Wednesday, September 4th are included with the tour price. The tour ends on September 5th and lodging is not included that night. We have not made any reservations for September 5th.